At Costco, though, there are only oversized shopping carts. So if I must go, I’m there on a weekday at 9:45 AM, waiting for the doors to open. List in hand, I race through my preplanned root. My record shopping time is 8 minutes and 24 seconds. My visiting Chinese-American in-laws hounded me to take them to Costco two hours before it opened. We compromised and arrived a half-hour before they opened. I foolishly assumed Andy’s parents were like me, ready to Costco shop at top speed and efficiency. Instead, I learned my in-laws operate under a very different set of rules. Rule #1: Never shop on an empty stomach. You might make a beeline for the warehouse doors. They will go straight to the exterior food court and order a giant Costco pizza. While you wait for the pizza, you will helplessly watch the parking lot fill with shoppers. By the time the pizza is ready, shopping carts clogged every aisle. Rule #2: Even if your Chinese-American in-laws have spent two days telling you you’ve gotten fat, you are expected to eat the all Costco pizza they put in front of you. Rule #4: A daughter-in-law attempting to drive the shopping cart is a severe breach of etiquette. There will be protests. Loud ones. Followed by enough stares that your scene-eschewing, White Anglo-Saxon Protestant soul will shrivel into a mortified ball and you will relinquish the cart. Rules #5: Walking by free samples is also as severe breach of etiquette. Expect protests until, cowed, you rejoin in-laws by samples. Rule #6: Refusing samples is as futile as refusing pizza, and will end in a similar argument and you will lose yet again. Rule #8: Attempts to resist B (above) will be met with loud homilies on the merits of orange juice to keep one regular (thereby creating the logical need for A). Other shoppers will find such homilies entertaining enough to stop and watch. Do not encourage spectators with eye contact. Rule #9: The desire to end the shopping trip as soon as possible will result in forgetting several items on your list. Rule #10: One of those items will be antacids. Thanks to excessive pizza and scenes, there will be heartburn and serious regret by the time you reach the checkout. Rule #11: Trying to pay for your Costco purchase will result in hostilities. Rule #12 : Person with lower threshold for public scenes will lose hostilities. Rule #13: WASPs have a much lower tolerance for scenes than Chinese-born. Don’t even try to compete. Rule #15: Amount of in-laws’ Costco purchase is directly proportional to the number of minutes non-purchaser is doomed to spend hearing about in-laws’ exorbitant medical bills during dinner. Heartburn increases with stress. Rule #16: Above all else, don’t forget the giant-sized bottle of Tums. While I enjoy a good casual walk through an upscale specialty grocery store, warehouse stores are meant to be quick and fast. Nothing looks wonderful and tempting in cases. Our store has not had samples but then again I go at 9 and that’s too early for samples. I hope you picked up your supply of tranquilizers too. My Chinese friend used to complain about costs all the time, even the fact that cheese on a Burger King whopper was 16 cents extra. Maybe it’s a national pastime, like soccer. Your warehouse opens at 9?! I am so very jealous. Sadly, one cannot get valium at Costco without a prescription. And you should see the line for THAT! We have both a Costco and a BJ’s. The BJ’s opens at 8 for the upgraded membership. It’s not too bad at 9 except around the holidays. Then I wonder why all those people aren’t working! Oh man Autumn. I love this post, hilarious… I can’t even imagine going to Costco with my in-laws, it’s hard enough just to go with Richard. Like Andy, Richard (and his family) are devoted Costco shoppers and have had a membership card for years (perhaps even decades). I went to Costco for the first time with Richard when I first moved back from Asia. Oh my god. Bad idea. I almost had a panic attack in there! Like you mention, the hordes of people, the huge shopping carts, the ugly, industrialized warehouse space. Ugh! In Asia (and even now) I’m used to shopping for one week’s worth of food–but in Costco, you gotta think like, weeks and months. My anxiety shot up when I bought 20 chicken legs or 50 tomatoes cause I was wracking my brain about how I could consume all this food without waste. I came to the conclusion that I should only shop for food at costco if I have a mormon family of 10, or if I buy non-perishable items only. Although I don’t mind meandering a bit around a store, Costco is the absolute worst place to stroll. It’s ugly, crowded and just… gross. haha. I much prefer Trader Joes or Ralphs. I can’t believe your in laws ate a WHOLE PIZZA!!! Those things are HUGE!!! Richard loves the chicken bake and I just… can’t. 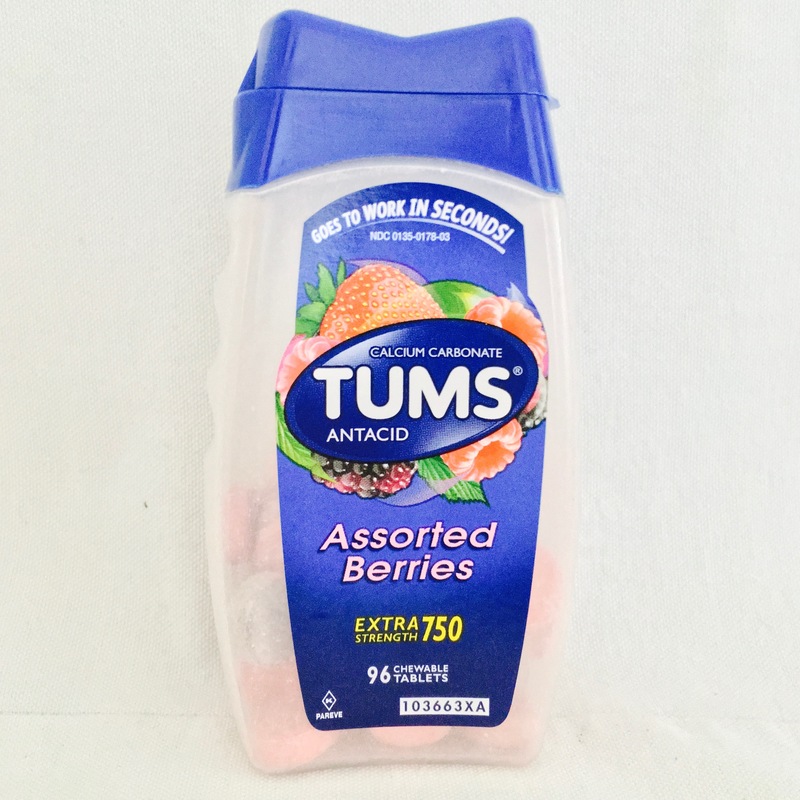 Like you, I run to the tums. Ahahahaha… so true, so very true. No, there’s no way you can buy anything non-frozen for two people at Costco. Although around Christmas time Andy once bought me an enormous bag of flour and he was so proud. Like he’d bagged a deer. He also bought me an enormous plastic tub for the 20 pounds of flour, which doubled as a turkey brining container. I can go through a few flats of eggs for baking season, plus a carton of heavy whipping cream, but mostly it’s stuff like toothpaste, toilet paper, soap, tissues, laundry detergent, and blocks of cheese. Andy gets most of his produce at the Farmer’s Market in Torrance on Saturday, which is more expensive but way tastier. Don’t worry, much of the pizza came home. Those suckers are huge. Which is why you only buy ONE SLICE, amirate? The scenes are where my in-laws have me over a barrel. I’ll cave, every time, other than have an argument in public. That sounds just lovely. I am also a person who knows exactly what is needed and buys those things without going anywhere else in the shop. No need to spend more time than neccessary! However that is impossible when MIL is with us or when we are in China together with my -in-laws…grocery shoping can take 2-3 hours, it is madness. Or, like Mary says, if you have a Mormon family of 10, a warehouse makes sense. It would have been great for my parents, but they never joined one until I left home. I’m like you, Autumn, I only buy non-perishable necessities from Costco. And I go early to avoid the crowd. I am like you at the grocery store, all prepared and basically in and out. No wandering around unless I am feeling a bit peckish and want some chips or chocolate which will only be around five minutes more. I always wondered what a Costco is until a few years ago, one opened in Australia. The membership was $50 a year and I decided to sign up for one year. I went in and the outdoor foodcourt was disappointing – it was indoor and it barely served anything. But there were these massive frozen pizzas that could last a whole week’s dinner. They were so tempting. Each time I went, I bought candy and chocolate, and some imported biscuits. That was all. They usually have good cheese and cheaper, high-end alcohol, too. Andy likes to get bourbon there, but it’s not always in stock. Those pizzas are huge. You have to be a teenaged boy to eat one. Sam’s Club is evil — owned by Walmart, they are such awful employers they actually got sued for locking their employees in their warehouse and chaining the fire door shut so employees wouldn’t take any breaks. They don’t pay a living wage, their employees are all technically “part time” so they get no benefits… Anyway, there’s a pall of misery over that store, while Costco has decent, helpful employees that get full-time work. That’s awful! Can they still find people willing to work with them after that was known?? Of course. People don’t investigate their President before electing him around here — investigate an employer?! Ha. And even if they did realize their Walmart/ Sam’s Club were evil, they might need a job. Hahahaha Peter gets the “you’re getting fat – here eat more” at his parent’s house all the time! Also, 8 minutes and 24 seconds in an AMAZING record! Why thank you! And only one person was harmed during the creation of that Costco sprint. Andy gets that same Peter treatment. His parents complain and then shove food on his plate. I think my list would stop at an alternative number 1: don’t go shopping with your in-laws. Yes, don’t go shopping with in-laws would be ideal. I don’t think I ever did that again. They like to be chauffeured around, though, and so Andy had to make the sacrifice. Maybe because we have retired people with nothing to do or nowhere to go. They don’t feel the same sense of urgency. This is the first post I’ve read that has made me suspect that you secretly like your in-laws. This is hilarious, and I believe every word of it. This thing about not wanting to make a scene over a bill always leaves me losing the fight and then feeling guilty and cheap. One of my daughters family belongs to Costco. They don’t mind buying huge packages and eating the same thing over and over. I prefer not to waste, to eat really fresh food, and to eat a variety of things. As you can see, Costco doesn’t appeal to me. But when I go shopping with my daughter, I can see the appeal. Some of the food looks delicious, and the prices are good … if you can eat that much or have lots of parties.